When the lords of Bilehall swore fealty to Waiqar the Undying, it is said that he took their oaths at sunset, standing upon a mountain that bordered the two regions. The traitorous lords became something vile that night, neither living nor dead. As the darkness cleared and the lords descended, the hamlets and farms of their domain were gone, another swath of land swallowed by the corrupting mists of Waiqar. 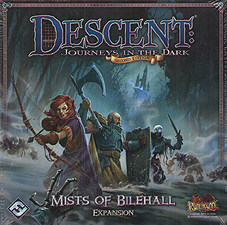 Mists of Bilehall is an expansion for Descent: Journeys in the Dark Second Edition. It introduces a perilous one-act campaign set within the domain of Bilehall, a fiefdom of Waiqar the Betrayer. The heroes must overcome horrifying foes while solving the mystery of their own tainted flesh in ten exciting encounters. A horde of grotesque monsters and powerful lieutenants surge across a new set of treacherous tiles, bringing the haunted Mistlands to your dungeon delving adventures.